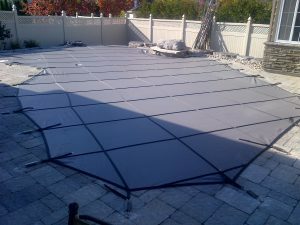 Safety Covers – Pool Builders Ltd.
Our safety covers are provided by CoverLogix which is part of Lathem Pool Products. The 5000M standard mesh safety cover is available in blue, grey, green or tan. We recommend a 3’x3′ grid for freeform pools and a 5’x5′ grid for rectangle pools. Rectangle pools larger than 18’x36′ should use a 3’x3′ grid. If you are interested in purchasing a safety cover, please contact service@poolbuilders.ltd for an estimate. The average cost for a cover ranges from $2,500 to $4,000. Prices vary depending on the size and shape of your pool as well as the amounts of cutouts for water features. We require a 50% deposit when the cover is measured and the remaining balance after installation. The installation of your safety cover will be coordinated along with your pool closing.